Elihu Vedder (American, 1836–1923), Star of Bethlehem, 1879–80 . Oil on canvas; 36 3/16 x 44 3/4 in. Milwaukee Art Museum, Gift of Mrs. Montgomery Sears, M1925.2. Thanksgiving has come and gone and you know what that means – the “holiday” season is officially upon us! If you hadn’t already experienced red and green decorations and Christmas music vying for your attention in October before your pumpkin could be carved, then surely by now, during this week of creative reuse of turkey, you have noticed that December’s holiday mania has set in. Cue: Sweaty palms, anxiety over what gifts to buy, and finding time to do get it all done. All so that you can have a merry, happy, snowy holiday celebration full of family, friends, food, gifts, etc…whew! The frantic holiday scene I’ve described is starkly in contrast to the peaceful one we find in Star of Bethlehem created by American painter Elihu Vedder in 1879-80. This painting, currently housed in Milwaukee Art Museum storage, depicts a serene moment in the muted, golden desert. Three figures on camels overlook the path before them, while three shepherd/guides ahead and three behind also survey what lies ahead. Color can be seen in the distance in the green of trees. Above them the sky contrasts what is seen below with a bright light that illuminates the sky. There is a sense of anticipation created by figures that can be seen in the clouds, standing there, backs slightly hunched as they look down upon the earth. The supernatural edge of the painting given by the cloud figures is an interesting twist to the painting. This element wasn’t uncommon for Vedder’s works. 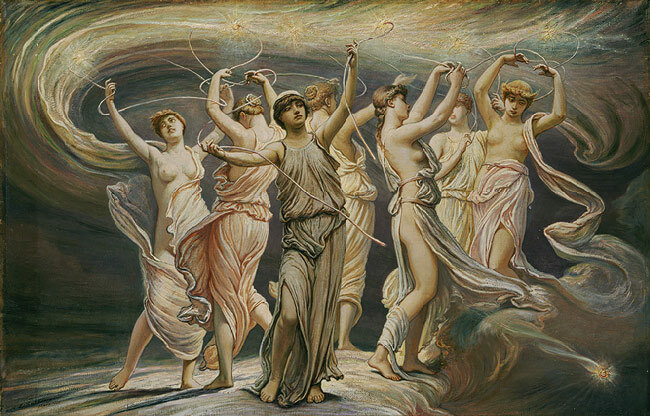 Another of his paintings Pleiades, in the collection of the Metropolitan Museum of Art and pictured below, depicts seven robed women dancing in the sky, waving what appear to be long cords or fuses with sparkling lit ends, brings to life an imagining of the Greek myth about the constellation. There are several versions about how and why the Pleiades, or the Seven Sisters, were immortalized in the sky. One version has them placed in the heavens by Zeus to evade the pursuit of Orion, another version has them turned into stars in order to comfort their father Atlas who was forced to carry the heavens on his shoulders and yet another explanation is that the sisters were so distraught over the fate of their father that they committed suicide. Much of Vedder’s other work also depicts this kind of symbolism of spirituality, imagination and dreams, with classical figures and slightly unreal elements. In his book The Digressions of V, Written For His Own Fun and That of His Friends, Vedder makes a statement, which I believe explains the mixing of styles found in these works. Vedder’s artworks are an embodiment of the way he was situated in the world. His canvases are an expression of his curiosity with the mystical, but also his simultaneous comfort in reality. Star of Bethlehem therefor shows both fantasy (the looming cloud figures) and grounded elements (the earthly camels and realistic landscape). 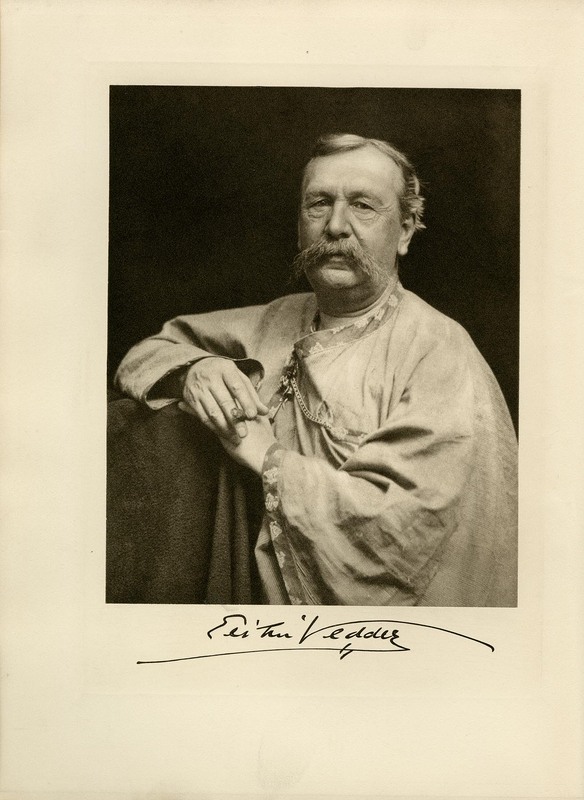 Elihu Vedder, from "Digressions of V" (Houghton Mifflen, 1910), frontispiece. Milwaukee Art Museum Library Collection. Vedder mixes reality with imagination. The experience of visiting the Museum as a whole has a similar effect, stirring the imagination and conjuring up visions at the same time teaching facts about people and places. Whether viewing works with magical or symbolic elements, or ones based strictly in reality, each gallery and each work of art opens up a new world and new set of questions. As an intern here at the Museum I am fortunate enough to slip away into the galleries of my choosing each week, always discovering something that grabs my attention and speaks to me in a new way. Although physically the artwork may remain the same, I’ve learned that they are also constantly changing as my orientation to the world changes – as I am exposed to current events, by what I read, and by social and other encounters. What I thought I had seen before, becomes new and takes on different meaning as I visit again and again. Like Star of Bethlehem, we may feel like very small figures, surrounded by a vast desert, but we can’t forget that although that part of the painting is the focal point, it also only takes up one-third of the painting. It’s easy to get caught up in the hustle and bustle not only of the holiday season but of everyday life. Let’s face it, there is probably little we can do to change the holiday madness that ensues out there. But that doesn’t mean that there’s nothing we can do about it. Like a work of art, all it takes to see things differently and keep those palms dry and the stress down is a little change of perspective. 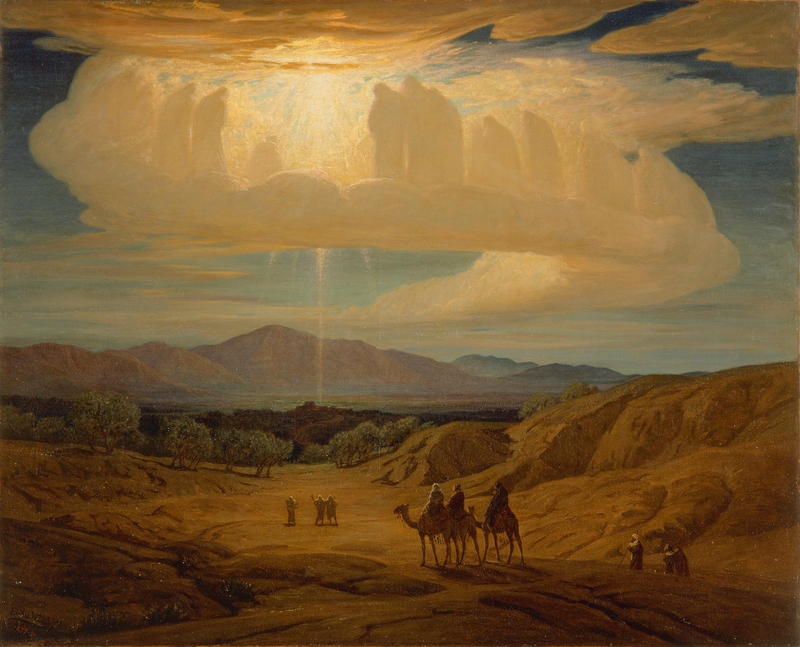 This entry was posted in Art, Curatorial and tagged 19th Century Art, American Art, Christmas, Elihu Vedder, From Museum Storage, From the Collection, Holidays, nativity. Bookmark the permalink. Great commentary, Lydelle. I’m so-o-o impressed. Didn’t know you had this appreciation for art in your portfolio. Please keep me in you “send to” file. This article made me want to visit the museum and wish you could be my guide there! Bravo! I really enjoyed reading your review of the Star of Bethlehem. It made me want to see the painting! This important painting belongs in the permanent display of the Layton Collection. This painting is highly symbolic for those of us Christians who have traveled to the actual region of Bethelem, and viewing this wondrous painting helps to underscore the relivance it has. Please show this painting permanently. Dear Gerald, I’m happy to say that this painting is now on view in the Museum’s permanent collection, gallery #16 on the Main Level! We hope you’ll be able to come take a look soon. Thanks for your comments! I’ve loved this painting since I first saw it on a Christmas card about twenty years ago. It took years of online searches just to find some discussion of it; I’m so glad to know it is on permanent display there now. I’ve always wanted a print/reproduction for my office wall. I don’t suppose you know if that might be possible? Hi Bryan, thank you so much for your comment! We’re so glad you came across the blog post and that you, too, love the Vedder. I checked with our Museum Store, and unfortunately, we don’t have a reproduction of this available. We do offer print on demand for certain works, but not every work in the Museum’s Collection. That said, we do like to know which works visitors are most interested in for reproductions so we can consider them as options, so rest assured we’ve got this piece on that list! We’ll let you know if we are able to offer a reproduction of it in the future! I have sent people to the Museum just to take a look at this work ! Some came away disappointed that it was not on display when they arrived. Thank God it’s available now !